Welcome to Nemaco Technology's reference section that provides technical information for many types of 19 inch EIA RackMount Computer Server Enclosures & Cabinets. Nemaco Technology designs, manufactures and sells standard and custom 19 inch RackMount Enclosure & Cabinet products in the following NEMA 3, 3R, 4, 4X and 12 ratings for industrial computer servers. 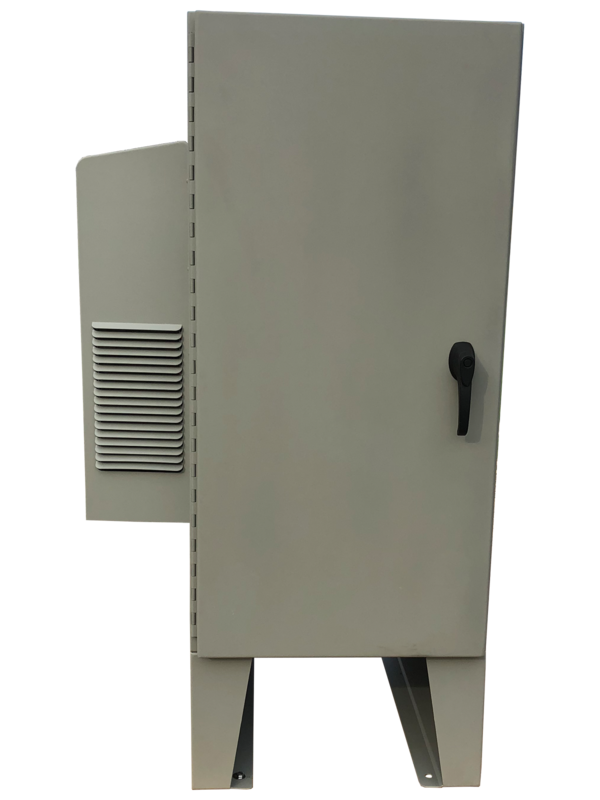 Nemaco can customize many of the standard 19 inch Rackmount Enclosure & Cabinet product to meet our customer's for outdoor desert dust & tropical rain resistance, cold & icy snow environments, heavy washdown waterproof requirements and applications requiring chemical & acid corrosion resistance. Call Nemaco™ to get a Computer Server Cabinet Solution Today! 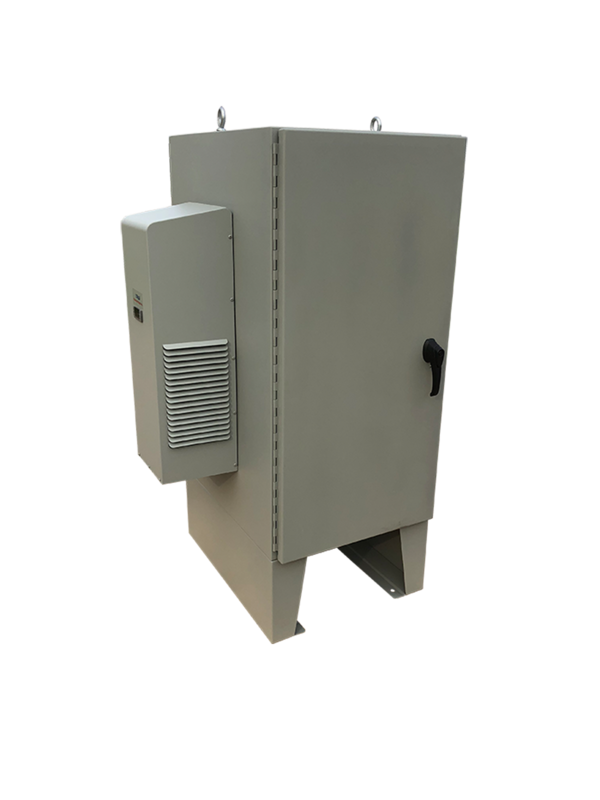 In particular, Nemaco specializes in custom air conditioned rack mount enclosures for water spray resistant, rain proof, washdown & waterproof industrial applications. Nemaco can provide all the enclosure design and manufacturing for many types of 19" rack mount enclosures. In particular the orange rack mount enclosure shown is a custom NEMA 3 / 3R Enclosure Rack Mount Enclosure that was designed and manufactured for an american tele-commununications company. The orange NEMA 3 / 3R rack mount enclosure was designed and manufactured by Nemaco and then shipped to the customer. The customer installed radio (perhaps microwave radio) equipment in the enclosure. Then the 19" NEMA 3 /3R rack mount enclosure was installed in the Amazon Forest in Brazil for telecommunications applications. All Nemaco Technology's industrial 19" eia NEMA 3R / 4/ 4X (rain resistant and washdown waterproof) rackmount server enclosure and cabinet products are available with the following options: adjustable rack rails, clear lexan windows, temperature controlled AC cooling, double doors, grounding studs, padlock provisions, sub-panels (powder coated carbon steel & aluminum), single shelf, adjustable shelves, custom cut-outs and many custom colors (light computer gray, industrial gray, royal blue, sunny orange, super black magic). Also, Nemaco can offer NEMA 3 / 3R / 4 / 4X / 12 rackmount enclosures with A/C cooling (air conditioned) and vortex coolers. This vortex coolers have a distinct advantage for keeping the electronics cool and dry for both indoor and outdoor applications. The AC (air conditioners) units can be attached to the NEMA 4/ 4X rack mount enclosures and they keep the electronics cool and dry. And the AC units are available in a range of BTU cooling valves. Just tell Nemaco about your application and we will get the correct AC unit for your NEMA 4 /4X rack mount enclosure. Call Nemaco for 19 inch RackMount Enclosure & Cabinet products with Cooling Systems.